Home » Memorial unveiled at Cramlington World War 1 airfield. Memorial unveiled at Cramlington World War 1 airfield. A ceremony was held at Northumberlandia today (Thursday November 8th) at the unveiling of a plaque donated by the Airfields of Britain Conservation Trust which commemorates the former World War I airfield at Cramlington. The airfield first opened in December 1915 and it is recorded that this was where properly organised fighter operations began in Britain for the first Royal Flying Corps unit of its kind created solely for Home Defence duties. No 36 Squadron formed on 1 February 1916 and the squadron HQ moved to Newcastle in October but fighters subsequently had Cramlington available to them as a night landing ground for the rest of World War One. Along with its Home Defence connections, Cramlington also played a major early part in developing anti-submarine patrol operations and the airfield was operational until 1936. 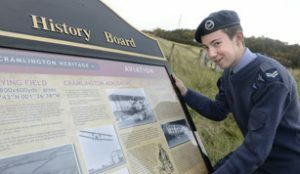 More information and pictures showing the history of the airfield can be seen on a history board installed by Cramlington Town Council next to the memorial. Duncan Hutt of Northumberland Wildlife Trust commented ‘We are pleased to accommodate the memorial and history board which acknowledge the history of the area’. Group picture: Members of 242 Cramlington Squadron RAF Air Cadets, from RAF Boulmer Wing Commander Darren Bassett, Officer Commanding Support Wing and the Station Warrant Officer, Warrant Officer David Barr, Cramlington Town Council chairman John Collins and Duncan Hutt from the Northumberland Wildlife Trust. Also pictured: Air Cadet Corporal Reece Garrett with the history board.